@pfidalgo1 does it just go down without warning or? sounds unusual, is it managed internally or outsourced? 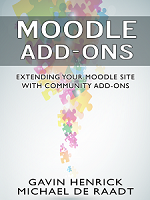 Each case study I read for the book reminds me of how diverse and widespread the use of #Moodle has become. Had a good day on chapter, tomorrow is the fun cropping images, proof reading and adding references and reflection. Settling down to finish my chapter for Moodle for Business. Coffee brewing and Sting on in the background. Now I am ready.